Fly Products introduces the Thrust paramotor in two versions, with propeller 122 cm and 130 cm available only with manual starter. Also for this model, we followed the principle of the versatility. It’s in fact possible to use 3 different systems of pilotage. The cage can be easily dismantled in 6 parts and the main frame, made in strong aluminium, assures great solidity. On this model the new "Moster" 185 engine. The main feature of this paramotor is a wonderful ratio between weight and power. The trust is 75kg and the total weight is 24kg. The Fly Products paramotor can be equipped with two different steering systems on the same chassis. Active Hang Point, Active Sport Comfort All two systems were tested by the best pilots in the world to internal national and international competitions, thus ensuring reliability and performans top. 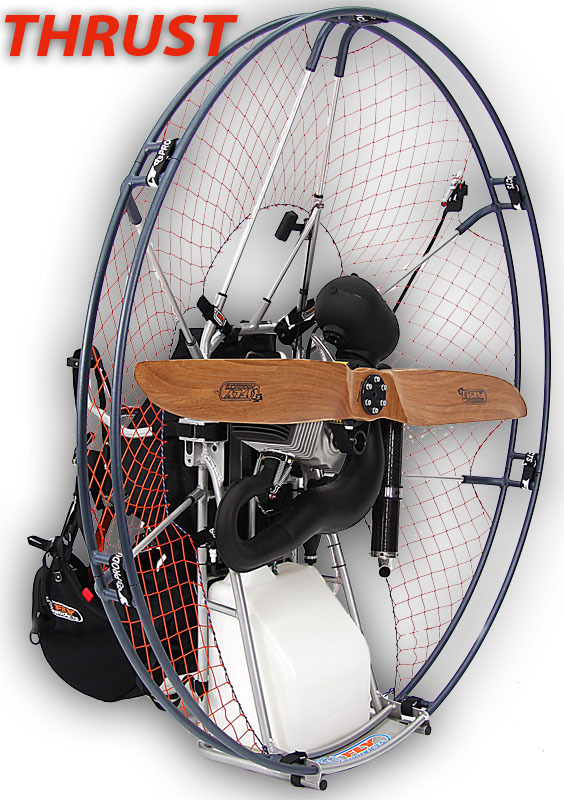 Click the button below to add the Fly Products Thrust Paramotor to your wish list.